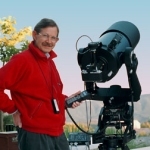 Philip Perkins has been interested in astronomy since about the age of twelve, when he can remember reclining full length on the dew-laden lawn of his parent's house in Parkstone, Dorset, trying to spot the polar caps of Mars through a 2" non-achromatic refractor he was given for his birthday. He started to become seriously involved in astrophotography in December 1996. To support the quality he required he started making regular astrophotography trips to the south of France, however many of his images continue to be made from the back garden of his house in Wiltshire. Philip's presentation consisted of data and superbly taken images of his equipment and astronomical images. His talk started with what equipment was needed to produce astrophotography. Starting with the 35mm SLR camera, covering the medium format camera and finally the CD camera. He then concentrated on developing techniques for 35mm and medium format film and how he gets the images into his computer using scanners. We were shown images of what telescopes he used and how he mounts his cameras to them. It was of interest to members how he makes his fabulous images so good. He uses software which stacks multiple images of the object he is imaging. This software sorts through the images and stacks the best ones into a final image on the computer. This image can then be printed up to poster size. Philip also brought along some examples of his posters. These can also be seen on his website www.astrocruise.com.